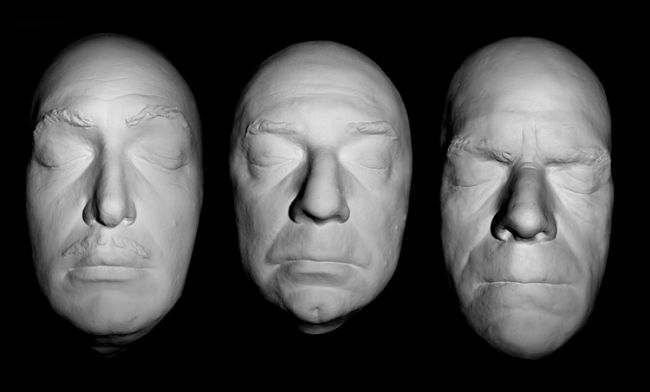 The Famous Monsters Life Mask Set - The three biggest names in Classic Horror at a special price, a rare collection of high quality face castings of Vincent Price, Bela Lugosi, and Boris Karloff. This set is cast in strong and lightweight reinforced polyurethane resin and comes with a lifetime guarantee against cracks, chips, and breaks. This set of 3 life masks comes ready for wall hanging with a sturdy wire hook in the back. Choose White, Antique Gold, or Silver finish to match your collection or compliment any decor. These life masks are cast from originals that have been in our collection since the mid 1963s, rescued from the trash bins of Universal Studios by our collection's founder, Ken Patterson. BELA LUGOSI MASK SPECIFIC INFORMATION: A LICENSING FEE/SETTLEMENT WAS PAID TO COMEDY III PARTNERS AS AGENTS FOR THE LUGOSI ESTATE FOR THIS MASK IN 1999. THE NAME AND IMAGE BELA LUGOSI IS A REGISTERED TRADE MARK AND IS USED HERE ONLY TO IDENTIFY AN ITEM OFFERED FOR SALE THAT WAS COVERED IN AN AGREEMENT BETWEEN THE HAUNTED STUDIOS AND COMEDY III PARTNERS AS AGENTS FOR THE LUGOSI ESTATE. BORIS KARLOFF MASK SPECIFIC INFORMATION: A LICENSING FEE/SETTLEMENT WAS PAID TO COMEDY III PARTNERS AS AGENTS FOR THE KARLOFF ESTATE FOR THIS MASK IN 1999. THE NAME AND IMAGE BORIS KARLOFF IS A REGISTERED TRADE MARK AND IS USED HERE ONLY TO IDENTIFY AN ITEM OFFERED FOR SALE THAT WAS COVERED IN AN AGREEMENT BETWEEN THE HAUNTED STUDIOS AND COMEDY III PARTNERS AS AGENTS FOR THE KARLOFF ESTATE. VINCENT PRICE MASK SPECIFIC INFORMATION: THIS MASK WAS PRODUCED IN 1999 UNDER AN AGREEMENT THEN IN FORCE WITH BINK, LLC. THE NAME AND IMAGE VINCENT PRICE IS A REGISTERED TRADE MARK AND IS USED HERE ONLY TO IDENTIFY AN ITEM OFFERED FOR SALE THAT WAS COVERED IN THE 1999 AGREEMENT BETWEEN THE HAUNTED STUDIOS(TM) AND BINK, LLC. These are great, but for me plaster will always be king. Good detail, light weight, pure white in color, but I knocked one star off for not being plaster. Did I say I prefer plaster? These are the same life masks that were in the Ackermansion when I was a kid. And it doesn't hurt that they are really 1/3 the price of any other vendor selling the same mask.